I have been lurking here for a while as I see this as perhaps the most modern development of low power, stand alone Hardware and Software (firmware) for APRS. I am trying to find something that fits my current need, that is for a solar powered, APRS digipeater and Weather Station data transmitter. Most of what I find on the internet is often out-dated, power hungry or proprietary (not open source). I already have a Raspberry Pi running DireWolf + Baofeng HT, which works really well, but is still a little power hungry for my needs (the R-Pi that is) ! So, can microaprs/micromodem be turned into a standalone, digipeater and ideally with the ability to query an attached weather station and transmit it's data at regular intervals (similar to a GPS input)? I can't find anything that fits my needs and hope micromodem/microaprs would be able to fit my needs. I'm sure there is a need for small, low power/low cost 'fill in' digipeaters as coverage in my area is sparse at best as the countryside is quite hilly. I'd think you could use the microAprs firmware to create a digipeater.... my setup includes a GPS which I query and has both receive and transmit. Since you get the decoded packets inside a callback, you'll need a few more global variables than normal to store that data off when you get it in the callback. Then your main routine can take that global variable and retransmit. The logic inside there will be pretty limited just because once I got microAprs and a GPS going, there wasn't a lot of space left for programming. So my architectural thought would be this: 2 nano's. 1 as the modem, and 1 to query weather station and as a controller. That way you'd have plenty of space for any controlling that you want to do. Power use should be better than an R-PI. My biggest obstacle is I'm more the hardware type than software - I can understand some basic stuff, but actually writing/programming is beyond my aged comprehension I'm afraid ! Can microaprs be made to work as a single board digipeater? Are there any working examples of that? As a fixed station, there's no need of GPS data and simply a single entry for lat/long would suffice. Sounds like a nice project! 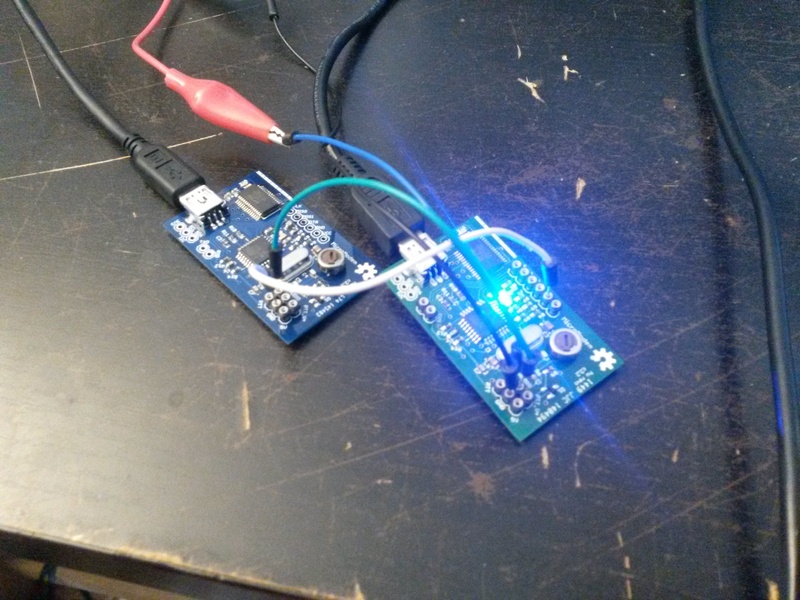 MicroAPRS can definitely be made to work as a single-board digipeater. There would also be plenty of processing power left to query a weather station on the serial port and transmit that every now and then. Doing a digipeater firmware has been on my todo-list for quite some time now I was actually just about to sit down and do some experiments on writing an Ethernet firmware for MicroModem, but maybe I should have a look at doing the digipeater firmware instead. It's definitely going to be a lot more simple! I think I'll just need to pull out the APRS reference manual and have a look at the protocol specific stuff for digipeating. As far as I remember, it's all relatively simple though, so it shouldn't be a problem. It would be fantastic if you were to create a single board digipeater - I'm sure there would be some real interest in it (and push sales along a bit?!). Even better if it could also query a weather station over serial as well and transmit the data periodically. I know a friend is looking for exactly this at a model radio control flying club that is 'out in the sticks' with no mains power, but they do have some solar power available. They are looking to regularly get local WX conditions only without the need to drive to site and find it is too windy or raining for example (digipeating is not on their priority list). I am interested in putting up a WX + digipeater at our local radio club, also no mains power, but due to have some solar (and maybe wind generated) power at our hilltop club site. We are lucky to have a diesel generator for weekly club night/weekend contests etc, so battery top-ups should be fairly regular. Thanks for the comments Stanley and Nigel! I think it makes a lot of sense to have a completely open digipeater platform as well. The low power consumption is also a big plus, MicroModem (the way I have implemented it) only uses 0.25 watts. This could be taken much lower by removing the FTDI USB chip in your own design, which is not really needed anyway, if it is a standalone digipeater. I am writing this as a separate firmware, which keeps the MicroAPRS KISS/SimpleSerial firmware uncluttered of digipeating functions. I have a working "dumb relay" now, just passing packets without altering the path (which of course is useless in real world, but the first step to an actual digipeater). 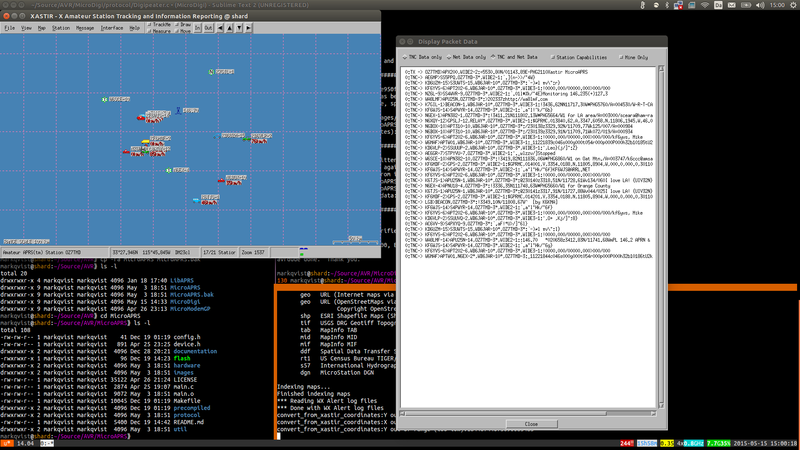 I am implementing WIDEn-N and FILL-IN digipeating algorithms now So far this is moving forward pretty quickly. Maybe I will have something working later today, but I need to go to work in a while, so maybe it won't be until after the weekend Looking forward to sharing this for some testing! Good news Mark. I am also more than happy to be a beta tester. An idea for the FTDI power saving is to have a header on the PCB with a jumper to apply power or not as needed. Another use of such a low power digipeater is for Amateur Radio emergency groups (RAYNET in the UK) as I have been talking to some guys around here and they currently use R-Pi + Baofeng + small lead acid battery. It works, but is quite heavy and lasts for a day or so. I am testing a Baofeng UV3R which will run quite happily on 5V (remove the battery as it's only 3.7V). The PA chips are the same as in the UV5R and the UV5R uses a 7.4V battery. All other internal voltage regulators are 5v tolerant. The output from these is quite 'clean' and they are quite efficient (no heat like you get with linear regulators). Any news on progress for the digipeater firmware? Great news Mark - really apreciate your effort. Let us know when the firmware is ready for download & testing as I am happy to be a Beta tester and give feedback to you. For my first post might I add a +1 for the digipeter! Are you from the UK and into FPV? OK, I think we have met over on RCG in the past (although I don't post on there much these days). Yep that would be me Nigel! Great stuff, I will post my comments on the new firmware thread.